Featured lesson plan: Who Are You Online? Forming an identity is a big part of being a middle schooler. Most students are working it out through experimentation, with plenty of awkward missteps and mistakes along the way. It's a normal, natural part of growing up. But in the age of social media, this part of adolescence can be tough -- both for kids to navigate and for adults to understand. New social media platforms come and go, often with features designed to captivate young users right in the midst of figuring out just who they are. To find out what some actual middle schoolers have to say about this, I visited Sarah Landis' classroom in San Jose, California, where she teaches ELA and social studies (in addition to a very interesting-sounding Minecraft class!). On the day I visited, Sarah was teaching the digital citizenship lesson Who Are You Online? to one of her sixth-grade classes. She and her students were kind enough to let me sit in and observe. 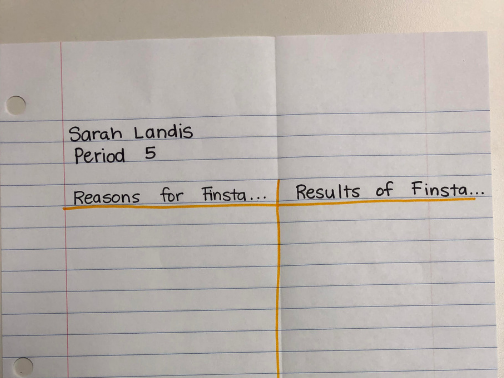 Seeing her students stop and think critically about their experiences online was a fascinating look into the ways that kids feel about, and interact with, social media today -- mainly Instagram. 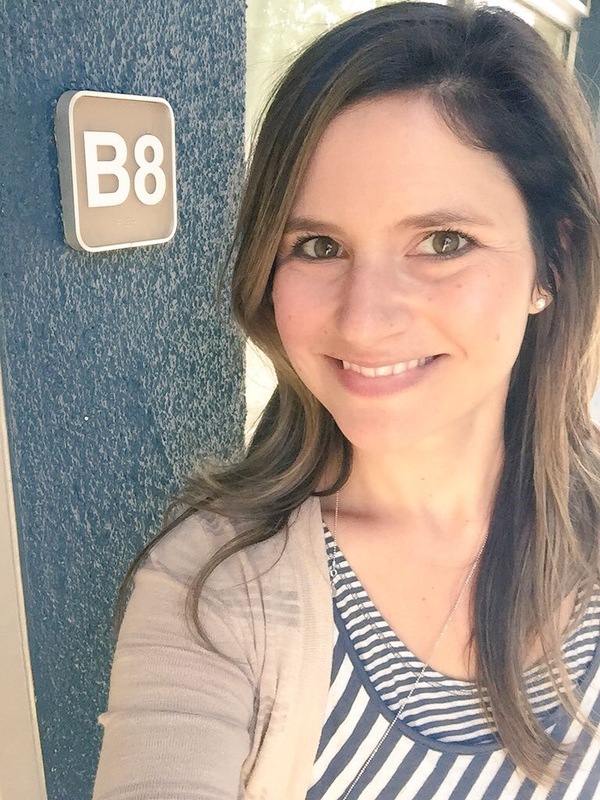 As the bell rang and her students shuffled out the door to lunch, Sarah and I sat down to chat about how the lesson went and why she feels it's so important for kids to have the space to discuss their online lives in school. What you'll see below are some highlights from our interview. It's been edited for clarity and length. Jeff Knutson: From your perspective as a teacher, what makes online identity such an important topic for kids to learn about? Sara Landis: I think it's so important for them because they're going to wade into that pool anyway. So, you're either going to teach them to swim, or you're going to watch them drown. So we need to give them the information that's going to help them make informed decisions. This lesson covers the idea of, what if you have things that you want to share with just a select group? And, you know, these other accounts -- these "secondary" accounts – are becoming so prevalent. I've already looked at [my students'] notes and I had a couple of kids write down "I have three accounts" or "I have four accounts." And these are sixth-graders. They're going to [use social media] anyway, so [we're] giving them the background, the language, to speak about it. And even for the kids saying things like, "I don't have an Instagram account," it's valuable because when they do eventually get one, they're not just starting out having no clue. JK: You started the lesson by basically explaining to your students, "Hey, most of you aren't 13 yet" or "You're not technically supposed to be on social media yet, but we're going to do this lesson anyway." Can you speak to that a little bit more? What’s the value of teaching this topic in sixth grade, when kids aren't actually supposed to be on social media? SL: You know, I just moved to sixth grade from fifth grade. And in fifth grade it was like, "Who has an Instagram account?" And the kids are afraid to even -- they're not going to tell you that they do. But here in sixth grade when you say, "Who has an Instagram account?" or "Who knows somebody who has one?," they're all raising their hands. So, even that idea that they have to be 13 to have it, it's, you know, not reality. And it's so blatantly not reality that they don't even feel any fear to admit that they have an account. And I think that in a lot of ways that's OK, because I'd rather have kids who have accounts who are talking about it with adults and getting some help and support when they need it, rather than just kind of secretly, quietly having these accounts and navigating it completely blind without any help or guidance. JK: So, for the most part, it seems like sixth-graders already know about secondary accounts, like finstas or spam accounts or whatever they want to call them. What makes talking about these things in class valuable? SL: I think that they already know about [having secondary accounts], but they know about it in a silo and they know about it within their little circle of friends. But talking about it in a classroom where there's so many different kids who have different views is valuable because they only know about it within the context of their friend group and how their friend group is using finstas. Spark conversations among your students about what it means to "be yourself" in digital spaces. JK: I noticed that you made some changes to the lesson and the slides. 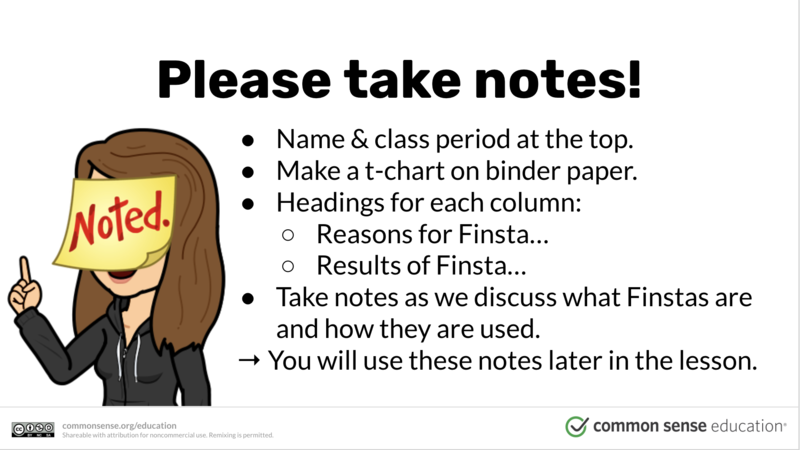 Can you talk about how you customized and adapted the lesson for your students? SL: So I like to use my iPad to present to a separate display. And when you do that, what it shows the kids is just the slide, but on the iPad it shows you the slide that you're on. It also shows you the slide that's next, and it shows you everything that's in the speaker notes. So what I did was I added to the speaker notes -- just things for myself so I wouldn't have to be referencing the lesson plan. I also changed the order of some of the slides. And I added an extra [vocabulary] term, the "real Instagram" term. I added little bits here and there. And then I also added the bit about my MySpace just to kind of include some of myself. I use my Bitmoji with my students all the time. So I threw the Bitmoji in there. They're used to seeing slides that I've made. A slideshow with no Bitmoji? My kids would immediately be like, "Where'd you get this?" So I had to throw in part of my personality, just because that's a big part of how I teach. JK: So, back to Instagram and online identity. What do you feel were the biggest takeaways for your students today? SL: So I think that one of the biggest takeaways for the kids -- I hope -- was that with social media in particular, you just keep on top of it and continuously ask yourself, is this what I want? Am I doing what I said I was going to do or what I really wanted to do? Is this matching with my morals and values? And kind of keeping that personal compass aligned with what you're doing in the social media world. Which I think is easier said than done. Not just for kids but for adults, too -- that idea that [it's] easier said than done. That was one of the things that came up in the class. You know, one of the kids said, "You should just be your real self all the time." And I asked them, "Who agrees but feels that's easier said than done?" And it was really the majority of the class raised their hands on that one. So I think that was another big takeaway for the kids. You know, they're constantly told –- especially [in grades] K to five, be yourself! Always be yourself! But it's easier said than done to be yourself in the social media world. And to be comfortable with sharing yourself in social media. JK: Yeah, that saying has been around forever, but it feels like it takes on a new meaning today. SL: Oh, absolutely. You know, be yourself is easy when you're around people that you know you're safe with. And when you're talking about that in the real world, it’s like, "OK, be yourself." "Am I comfortable to be myself in this group?" When you expand that into the idea of social media –- be yourself -- well, who's in this group that can see on my social media account who follows this account, and is what I'm going to post safe and comfortable with that group -- with that audience? JK: Do you think you'll do a follow-up lesson on this topic to explore it some more? SL: Yeah, totally. We have our [state testing] in, like, late April, early May. Then we end up with a month left of school and we've already taught the majority of our content. So I'm really glad that there are six other lessons to go look at because I really think these are things that we need to talk to kids about. Like I said, they're gonna wade into this pool, whether we teach them to swim or not. I think, going into summer, it's such an important thing for middle schoolers. They have so many weeks [with] less adult contact. So giving them some of those lessons right before they go into summer -- especially because a lot of them will be turning an age where their parents are going to let them get social media -- I think it's going to be a really good time frame for it. JK: It was so great to see one of our lessons in action. Thanks again for allowing us to visit! SL: Thanks for the opportunity to share what I do in my classroom!